A look at the open diary in front of me (which belongs to me) and the notebook that is carelessly tossed a meter away (which belongs to my colleague), and there is little doubt in my head about the dire need of a national handwriting day, every day of the year. We have that bad handwriting. The hypocrite that I am blames technology. With the advent of computers and mobile phones, we are habitual of typing instant text messages and send it in a jiffy. What is the use of laboring over handwriting anyways when there are easier methods? This National Handwriting Day, 23 January which is not only the birthday of the American founding father, John Hancock, whose signature on the Declaration of Independence is one of the most iconic piece of handwriting, but also a reminder of the fast disappearing act of handwriting, we want to evoke the need of handwriting, because it is beneficial for you. Another study carried out by Virginia Berninger, a psychologist at the University of Washington demonstrated that children produced more words more quickly when writing by hand that on a keyboard. Also they expressed more ideas. But the benefits of handwriting aren’t limited to children only. Handwriting has proved to increase memory and ability to process new information in adults. So, while writing itself has been said to bring strong physical and mental health, which includes improvement in mood and happiness, why not accelerate the benefits by switching to handwriting. As a writer, with a pretty bad handwriting I find fountain pens to help to some extent. The consistent flow of ink, and the richness it depicts as strokes form letter and then words, inspires any writer. It has been discussed that perhaps the reason why ideas form better when handwriting is due to the pressing of the nib on to the paper that keeps us focused. While typing, one is banging away on the keys and has his focus divided between what s/he is writing and the movement of the fingers. I personally find to be pouring more words and more ideas on the paper when writing by hand than when typing on the keyboard. And yes, you could be writing with a ballpoint pen or a rollerball pen but there is something deeply satisfying about the flex of the nib on the fountain pen and the smoothness of the ink and the visual treat the profound, wet lines provide. The line variations that seem to bounce off from one extreme to another and the shades created by the fountain pen is special and nothing can compare to it. Also, with fountain pens there is a certain ownership which could be because of its comparatively expensive price or the fact that you intimately fill her up and cleanse her that motivates you to keep using it and writing with it. And then there is the ultimate fact that the best of calligraphy or handwriting is achieved with a fountain pen. Cursive handwriting, which studies has proven to improve patience and creativity in children and adults alike is the most beautiful when done with fountain pen. 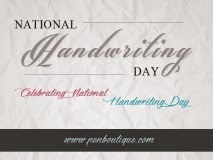 So, this National Handwriting Day, take up a fountain pen, or any writing tool for that matter and write by hand. Scribble your deepest, darkest thoughts or your impromptu ideas. Create poems or fantasize stories and if not that just try and improve your handwriting. Write by hand; if not for the sake of reviving the art of handwriting and the creativity that follows it, then for your health sake, which has been proven to benefit when you handwrite.